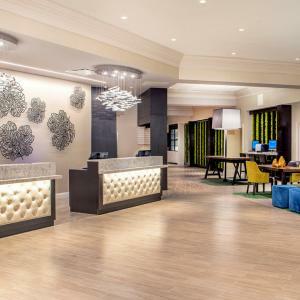 The full service and newly transformed Hilton Christiana is designed with your comfort and convenience in mind. On-site dining options include the new gastropub, Market Kitchen & Bar, the outdoor Patio which features seasonal live entertainment during the week. Our Courtyard Garden, seasonally created and kept by our culinary team, is infused into all aspects of food and beverage here at the Hilton. Whether dining in Market Kitchen & Bar, hosting a catered event, celebrating your wedding day, or experiencing the Club on Four , you will savor the freshly picked herbs and vegetables of our Courtyard Garden. Our guest rooms and suites are modernly styled and include Wi-Fi, tabletop lamp with built-in power outlets and USB port, 42 inch LG TVs with On Demand and HBO and other standard amenities. For an elevated experience, consider reserving a room on our executive level, the Club on Four, which features continental breakfast each morning and a cocktail reception Monday - Thursday from 5pm - 8pm. Our meeting facilities and innovative meeting enhancements ensure your event is highly memorable. We pride ourselves in our landscaped Courtyard and Patio which are absolutely perfect for outdoor events. Whether you are planning a corporate conference or a magical wedding in our gazebo, our team will make sure that everything goes exactly as planned. Why trust anyone else?